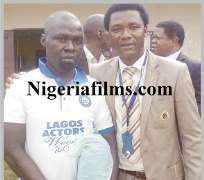 Factional chairman of Actors' Guild of Nigeria (AGN), Lagos State chapter, Don Pedro Aganbi had gone to the Ikoyi prison to donate some gifts to the inmates when he was surprised to see veteran Nollywood director of photography (DOP), Demola Ariyo among the inmates. Shocked by this, Aganbi asked how the award-winning DOP found himself in the prison and right there, he promised to get him out legitimately. True to his words, the action chairman of the guild got Ariyo out of prison as he (Ariyo) was released to Aganbi by a Surulere Magistrate Court 2. Justice Adeoye, the Magistrate of Court 2, Surulere, who had earlier adjourned the case to October 17 2013 pending when all the parties would have come to agreement, struck out the case when the parties involved told the court of their intention to settle out of court. Ariyo, who shot the popular film, 'Osuofia in London', was arrested five months ago by policemen attached to Bode Thomas Police Station for allegedly trying to cause bodily harm to staff of DSTV and Klink Studio over their refusal to pay him some amount of money he was owed. According to a staff of Klink Studio, Abayomi Olukanmi who is also a co-complainant in the case, it was not the first time Demola Ariyo was threatening both DSTV and Klink Studio. An elated Demola, after his release, promised to be of good behavior. He said, "my Chairman, Don Pedro Aganbi has asked me to forgive everybody and I have done so. I'm a free man now, after they have used and dumped me, they wanted to send me to jail because they have connection, but thank God for AGN, thank God for my Chairman, Don Pedro Aganbi." On his part, the AGN boss, Aganbi, explained that, "what has happened here today is not only a miracle but like Nollywood movie come alive. "We, AGN Lagos Chapter members had gone to Ikoyi prison to donate gift items to the prison inmates and to fellowship with them as part of our Corporate Social Responsibility (CRS) initiative only for us to see one of our own, Demola Ariyo who told us he has been wallowing in prison for up to six months now. "I promised to set him free in the presence of over one hundred AGN Lagos chapter members who were present at the Ikoyi prison when we went to donate prizes to the inmates and I am glad that, that promise has been fulfilled. "Demola did not become violent to these people over night something must have gone wrong and we must not pretend about it. He said he is been owed money for jobs he did for them. We are talking about a multiple award winning director of photography not just some road side cameraman. This is not good for our industry and to allow him spend six months in prison is totally repugnant to natural justice, equity and good conscience, in my view."